Benign metastatic leiomyoma (BML) is a rare disorder characterized by the presence of extrauterine leiomyomatous lesions. The authors report a case of a 70-year-old woman with previous total hysterectomy for uterine leiomyoma, that presented with dry cough and a history of progressive weight loss. Thorax computerized tomography revealed multiple nodular masses, suggestive of pulmonary metastases. The immunohistochemical study showed that the diagnosis was compatible with BML. The patient then presented a nodular brain lesion suspected of metastasis but died before the biopsy for etiologic confirmation. Keywords: Uterine leiomyoma; Benign metastatic leiomyoma; Pulmonary nodules; Brain metastasis. Leiomyomas are benign tumours originated from smooth muscle cells. Benign metastatic leiomyoma (BML) is a disorder characterized by the presence of extrauterine leiomyomatous lesions, usually pulmonary, but also in lymph nodes, liver, breast, heart and central nervous system1-3. BML is an extremely rare entity, first described by Steiner in 19391. The overall incidence of BML after leiomyoma is unknown4. It is more frequent in premenopausal women and its understanding is very difficult because of the histology of local benignity and the evolution for metastization5-7. In most cases, it presents with asymptomatic pulmonary nodules detected in women with previous history of uterine leiomyomas and is usually discovered incidentally on imaging3,6,8. BML metastases are generally asymptomatic, but there can also be clinical manifestations, such as dyspnea, cough and pain3,8. As a large number of pulmonary metastases are found to be positive for oestrogen and progesterone receptors, coupled with the observation that they may undergo complete clinical regression after presentation during pregnancy and after menopause, it is thought that they may be hormonally responsive3,8,9. A variety of hypotheses have been described for the BML pathogenesis: metastasis from a low grade uterine leiomyosarcoma (not recognized as malignant due to undersampling of the primary), lymphatic/vascular dissemination of a benign uterine leiomyoma (as the morphology, molecular and immunohistochemical features are characteristics for benign neoplasms despite the metastatic potential)8, a metastatic deposit of intravenous leiomyomatosis, a smooth muscle-rich pulmonary hamartoma and multifocality of primary smooth muscle neoplasia (leiomyoma, leiomyosarcoma)10-12. The authors describe a case report of a benign metastatic leiomyoma in a 70-year-old woman. The patient had a past medical history significant for hypertension, hyperlipidemia and diabetes. Gravid 3, para 3, she had entered menopause at the age of 54, with no hormone replacement therapy. There were no previous surgeries and no relevant family history. The patient was referred to the Gynecology consultation, at age 66, because of the diagnosis of a pelvic tumefaction during an adominopelvic ultrasound, which revealed “Uterus with marked enlargement of dimensions, reaching the right hypochondrium and the epigastric region. This increase in uterine volume is due to an heterogeneous well delimited lesion, with 15 cm of greater axis, containing areas of cystic degenerescence/necrosis and gross calcifications, suggestive of uterine fibromioma. However, given the existence of cystic areas and structural heterogeneity within a myomatous lesion, it does not exclude the existence of sarcomatous transformation”. It was performed an abdominopelvic CT which confirmed the ultrasound findings. The patient underwent total hysterectomy and bilateral anexectomy with extemporaneous study. The extemporaneous exam of the uterine mass revealed a uterine fibroid. Macroscopic examination consisted of a piece of hysterectomy of 20 x 15 x 10 cm with a whitish mass of 11 x 9 cm in the anterior wall; endometrium with several polypoid lesions, the largest with 3 cm; uterine cervix, ovaries and fallopian tubes without any macroscopic change. The definitive histological study (Figure 1) revealed uterine leimomyoma with central ischemic necrosis, without mitosis or cytologic atypia; immunohistochemical study was negative for p53 with a very low proliferative index (Ki67+ in only 2% of cells); the endometrium was atrophic with endometrial polyps without atypia; ovaries and fallopian tubes had no histologic changes. At age 70, the patient was admitted in our emergency service because of dry cough and a history of progressive weight loss of 13 Kg for 2 years, corresponding to 12% of total body weight. At physical examination the patient had a good general condition with mucous membranes stained and moisturized and a body mass index of 19.1 Kg/m2; at pulmonary auscultation, vesicular murmur was audible bilaterally, without adventitious noises; cardiac auscultation was normal; abdomen was soft and depressible, without any palpable masses or organomegaly; breast palpation was normal; there were no palpable cervical, axillary or inguinal adenopathies. 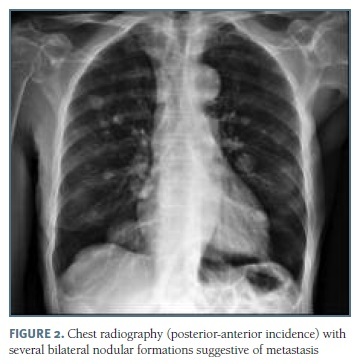 The chest radiography revealed "several bilateral nodular formations suggestive of metastasis" (Figure 2) and thorax computerized tomography (CT) revealed “multiple nodular masses in both lung fields, in all lobes, suggestive of pulmonary metastases, right pericardial adenopathy with about 25 mm, with no evidence of lung or mediastinal primary neoplasia” (Figure 3). The patient was admitted for further assessment: the abdominopelvic CT, the study of the digestive tract with upper and lower digestive endoscopy and the mammography were negative. An excisional biopsy of the right pericardial adenopathy was performed, which revealed "solid proliferation of ovoid to fusiform cells without clear atypia, on a fibrillar fundus, without foci of necrosis or patent mitotic activity, which in the immunohistochemical study showed positivity for alpha-actin, vimentin, estrogen and progesterone receptors, with low proliferative index, which are compatible with benign metastatic leiomyoma” (Figure 4). The patient was directed to the Oncology Gynecology consultation group. Three months after admission, the patient returned to the emergency service due to right hemiparesis and myoclonus. Neurological examination revealed a patient oriented in space and time with a coherent and fluent speech, without visual field deficits; she had no asymmetry and no alteration of facial sensitivity. She had myoclonus and paresis in the right half-body, associated with right hypoesthesia. It was performed a cranial-encephalic CT that showed a nodular lesion in the left frontoparietal region, with extensive edema, suspected metastasis from benign metastatic leiomyoma (Figure 5), confirmed with brain MRI. Biopsy of the brain lesion was suggested for etiologic confirmation, but the patient died. It was not possible to start any hormonal treatment in a timely manner. BML is a rare condition that can occur in patients who have a history of uterine leiomyoma. The patient later presents with a number of metastases, most commonly found in the lung, which are positive for leiomyoma on histopathology8,14. 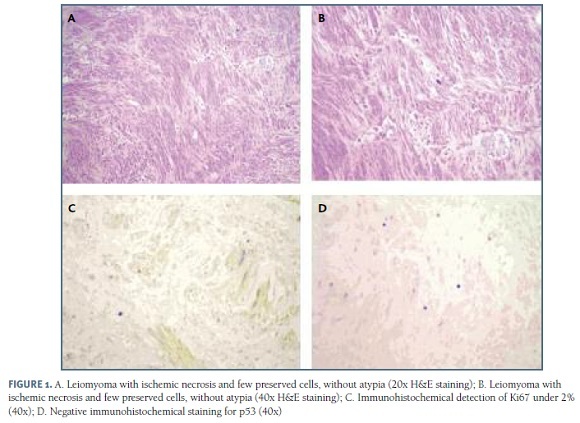 Microscopic examination of haematoxylin and eosin slides has demonstrated the characteristic features of smooth muscle cell differentiation, confirmed by immunohistochemistry smooth muscle actin positivity. Immunohistochemistry Ki67 showed a low tumour cell proliferation index, which favors a benign behavior, and there were no features of malignancy (necrosis, increased mitotic activity, marked cellular pleomorphism)9,11. Some authors describe the hypothesis of genomic imbalance in BML, such as the rearrangement of HMGA1 (6p21). However, Nucci et al. described consistent chromosomal aberrations (19q and 22q terminal deletions) in BML cases and suggested that BML is a genetically distinct entity11. Lee et al. concluded that BML may comprise a heterogenous group of tumours in terms of their malignant potential and pathogenetic mechanisms4. Thus, BML pathogenesis is most probably complex in nature and requires further multidirectional research, in order to improve present understanding of the biological characteristics of BML, thus leading to its optimal management. The presence of oestrogen and progesterone receptors in most cases make it amenable to hormonal therapy; however, management may involve metastasectomy, chemical or surgical castration or watchful waiting8. BML mainly affects premenopausal women because it is thought to be hormone-dependent. These tumours are rarely detected in postmenopausal women, are unlikely to increase in size and usually regress after menopause. Horstmann et al. report that the disease usually progresses rapidly in premenopausal women, and respiratory failure and death can occur; however, in postmenopausal women evolution is usually progressive and indolent. The case report we described departs from the descriptions in the literature since it is a case of postmenopausal BML in which there was rapid progression since detection of pulmonary leiomyoma metastases to the death of the patient. Only 9 cases of pulmonary BMLs in postmenopausal women have been reported in the literature7, 14-21. In conclusion, BML is a rare entity found in women with a history of uterine leiomyoma and commonly presenting as incidental pulmonary nodules on imaging. This is a case report concerning a 70-year-old lady who was discovered to have pulmonary nodules 4 years after hysterectomy with uterine leiomyoma evident on pathology. 4. Barnaś E, Książek M, Raś R, Skręt A, Skręt- Magierło J, Dmoch- Gajzlerska E. Benign metastasizing leiomyoma: A review of current literature in respect to the time and type of previous gynecological surgery. PLoS One. 2017;12(4): e0175875. 18. Anna M. Ponea, Creticus P. Marak, Harmeen Goraya, and Achuta K. Guddati. Benign metastatic leiomyoma presenting as a hemothorax. Case Rep Oncol Med. 2013; 2013:1-6. The authors thank the Hospital where they carry out their professional activity, namely the Departments of Gynecology and Obstetrics and Pathologic Anatomy. There were no funding for this work.